$12/DZ NECKLACE & EARRING SET. 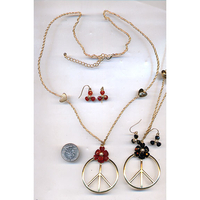 LEAD FREE, GOLD COLOR PEACE SIGN WITH A NICE GEM FLOWE ON THE TOP PART, WITH MATCHING FLOWER EARRINGS, 5 ASST COLORS OF FLOWERS. BLACK, IVORY, YELLOW, MAROON, AND BROWN. VERY NICE QUALITY. THE GOLD CHAIN ALSO HAS 2 DIFFERENT HEART CHARMS IN IT, COMES CARDED. QUARTER IS FOR SIZE SCALE., IS RACKABLE.